Not since the days of Harpo’s has Victoria had a city-defining live-music venue. Capital City Ballroom is ready to be that place. That’s how Towers and Trees lead guitarist Dave Zellinsky says it feels to be standing stage-front ripping a blistering solo in the Capital Ballroom. The sort of praise reserved for the “great” music halls — those iconic venues that define cities. Like the legendary Fillmore in San Francisco, CBGB in New York City, the Horseshoe in Toronto and, naturally, Vancouver’s Commodore. All ramped up into the canon of mythology by the hippest bands, by writers, poets, promoters and concertgoers who have held a ticket. It’s what the Capital Ballroom hopes to be. Opening a room and booking a few bands is no guarantee that you’ll become a cultural (or counter-culture) institution, a flagship for music and somewhere musicians think they have to play. Nick Blasko knew that going in. 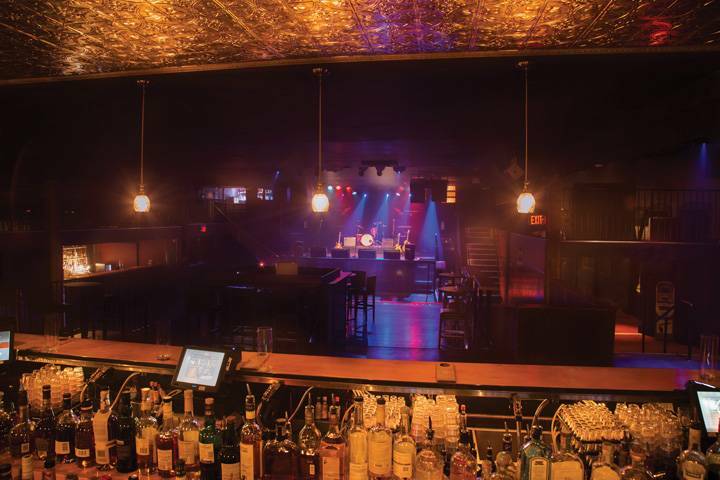 The co-founder of Atomique Productions, Victoria’s busiest promoter, is one of the team of 10 owners who purchased Sugar Nightclub and a lease on the Yates Street building, from Damian Cownden in 2016. It’s a group — Blasko, Dimitri Demers, Dylan Willows, Glen Barlow, Adam Duron, Chris Hibbins, Morgan Brooker, Stephen Franke, Colin McTaggart, and Teddy Yip — with deep roots in the music ecosystem. For Blasko, it’s the similar-sized halls like the El Rey Theatre in LA and the Bowery Ballroom in NYC that have achieved that status. And Willows strongly agrees that the strategy for the Capital Ballroom team has been to communicate that it’s not a nightclub, but a live music venue. The Capital Ballroom — once Sugar and Wastelands and Cactus Club and New York New York and Stardust over 40 years of name changes — has established itself in the pantheon of Victoria music halls as one of the big boys, if not the biggest. Capacity is 600, maybe 700 if you stretch the rules. But it’s always been ugly cousin to Harpo’s, the Wharf Street club decorated by a couple of decades of headliners like Pearl Jam, Alice in Chains, The Tragically Hip and Green Day. Not that it hasn’t had those I-was-there moments, like the 2011 Prince after-party. New ownership has upgraded the sound system, the stage, the green room, the liquor service — all part of the objective of making the Capital Ballroom that prominent, if not celebrated, venue. For Blasko, what sets it apart from other showrooms is a combination of great sightlines, ceiling height and capacity where the energy is high and the esthetic neutral enough to respect the individuality of the artists and nuances of various music scenes. Willows admits he always wanted to run a club. Even before he got involved in producing festivals (VIC Fest, Capital City Productions), his goal was to build a live music venue where all the bands he wanted to see could play. For years he’d had his eye on maybe buying Sugar. Blasko and Demers, lead partners in Atomique, busy with festivals like Rifflandia and booking acts into every other space in town, hadn’t put much mind to owning their own concert hall — and they certainly had no desire to run a typical nightclub. “It was enough to worry about selling tickets versus selling beer,” says Blasko, who now finds himself tallying bar receipts. But it’s all somehow worth it. During the Slow show last November, Blasko recalls a room full of aging ex-punkers from the 80s. In March and April, check out Capital Ballroom on Facebook for upcoming shows, including Badbadnotgood and Born Ruffians.